Puppies can be affected by a variety of heart problems. They can be congenital—present from birth—or acquired later in life, and some may be inherited. Heart failure results when the damaged muscle is no longer able to pump blood throughout the body properly. These conditions can be corrected by surgery, but this option may not be offered everywhere. The symptoms can be specific to the type of heart condition. General signs can include the puppy quickly becoming exhausted from exercise. An affected dog with heart disease typically acts weak or lethargic. The dog may have a bluish tinge to the skin of the lips, tongue, or inside the ears from a lack of oxygen. When the left side of the heart fails, fluid collects in the lungs (pulmonary edema) and results in a cough, labored breathing and panting. Dogs sit with elbows spread and neck extended while straining to breathe, and may even try to sleep in this position to ease breathing. Right heart failure prompts ascites—a swollen abdomen from fluid leakage inside the body. The fluid also accumulates beneath the skin and may fill the chest cavity (pleural effusion). Accumulation of fluid causes congestive heart failure. Diagnosis of heart disease is made using X-rays, ultrasound, and electrocardiograms that pick up irregular heart rhythms. 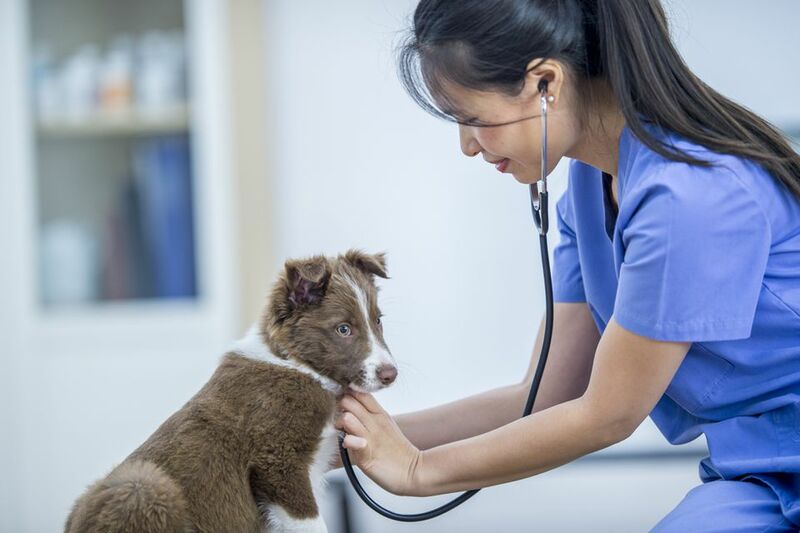 Advances in cardiac treatment, including open-heart procedures, today give puppies and dogs a much greater chance to maintain a higher quality of life or even being cured. There are not many programs able to do open-heart procedures, and the technology is mostly limited to universities and teaching hospitals. Your veterinarian can refer you to a specialist if your puppy could benefit from these procedures. The most common congenital heart disease, patent ductus arteriosus (PDA) affects miniature poodles and German shepherd dogs most often, but any pet may have the problem. It may or may not be inherited. Normally, the ductus arteriosus, a short blood vessel, allows blood to bypass the lungs of an unborn puppy. If the duct fails to close after the puppy’s birth, blood leaks back into the heart through the opening and leads to left heart failure. Surgery can cure the problem when performed early, and in the past, this has been the treatment of choice. A thoracotomy opens the entire chest wall to give the surgeon access to the heart to repair the hole. Cardiac catheterization can also be used to close PDA in pets. A flexible tube is threaded into the heart and the procedure is much less invasive. This can lead to quicker recovery. Another heart problem of puppies is pulmonic stenosis, which means a narrowing of the connection between the right ventricle, or lower heart chamber, and the pulmonary artery that leads to the lungs. Affecting small breed dogs most often, this congenital defect makes the heart work harder to push blood through the narrow opening. Heart muscles sometimes compensate by growing stronger, but many times the heart defect becomes life-threatening. New catheter techniques can also treat the pulmonic stenosis. Performed under anesthesia, the procedure requires a small incision into a blood vessel, and a catheter is passed through the vessel to reach the heart. A balloon is extended from the catheter and inflated with saline. This expands the region where there is narrowing, opening it to normal size. The procedure is identical to that performed on children with pulmonic stenosis. Heart catheterizations are specialized procedures, and only a few centers across the country to perform them. Open-heart surgery offers a newer option for treating stenosis. The technique can very successfully treat this congenital defect but is offered at only a few medical centers. Patients must also meet stringent requirements to be considered as candidates. Large breed dogs like golden retrievers are prone to aortic stenosis, a narrowing of the connection between the left ventricle and the aorta, the large artery that carries blood out of the heart. Surgery is the treatment of choice, but it is risky, expensive, and available only at veterinary schools or specialists that have access to cardiopulmonary bypass machines. When the condition is one thought to be commonly found in your particular breed, ask the breeder about the history of the parents. Reputable breeders will do all they can to breed away from heart defects, whenever that's possible.